What if we told you there is a method of design that can reduce employee stress, boost productivity and begin to help UK businesses save some of the £29 billion a year paid in sick leave? 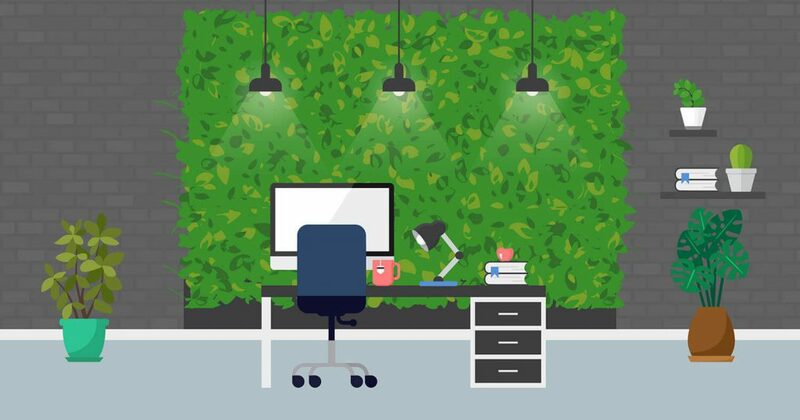 Let’s take a good, long look at biophilic design and how it can transform the fortunes of your office and its occupants. Biophilia means ‘love of nature’. Specifically, it refers to an innate attraction human beings have for the natural world, its forms and its processes. It hints to the affinity humans have developed for organic surroundings over the thousands of years spent living in forests, mountains, deserts and coastal areas. The term was brought to prominence in the 1980s by Edward O Wilson, a psychologist who observed that urbanisation was leading to increased disconnection with the natural world. Wilson noted that as more people migrated to cities throughout the world, biophilic principles would become important to maintain health and wellbeing. Biophilic design places this principle front and centre and approaches things with a human-centric eye, prioritising the incorporation of natural elements into all aspects of design. The philosophy is successful in architectural, interior, commercial and domestic design with an emphasis on improving health and well-being via biomimicry in the built environment. Productivity in the officecan be increased by 8% and wellbeing by 13% with reductions in absenteeism and presenteeism. Guests of the hospitality sectorare willing to pay up to 23% more for a room with a view of natural elements. Students in schoolssaw 20-25% improved test results, concentration levels and attendance as well as improvements in behaviour of students with ADHD. Pain medication requests in the health sectorwere reduced by 22% and post-operative recovery rates improved 8.5%. Rental rates on retail spaceswere worth more because customers were willing to pay up to 8-12% more for goods and services. In thehome, biophilic elements and rural settings are calming with 7-8% lower crime rates. Access to nature also adds 4-5% to the value of your home. To implement biophilic design to great effect, it’s important to understand how the effects can be achieved. Namely, biophilic interior design can be achieved through direct or indirect experience of nature. Space and place must also be considered with contrasting areas of busyness and refuge, organised complexity and transitional spaces that merge the contrasting elements. By 2020 it’s predicted by The World Health Organisation that stress related illness, such as mental health disorders and cardiovascular disease, will be the largest contributing factors to premature deaths in the UK. With fewer naturally oriented spaces than ever before, it is getting harder to find opportunities to replenish our mental and physical faculties. By incorporating biophilic design, it is suggested that natural elements in the built environment will help to lower the heart rates and stress levels of those within and improve self-reported well-being scores. Secondary effects include increased productivity and creativity for businesses as a whole. Spectrum Interiors is a premier office refurbishment company with years of experience in facilitating businesses to express their unique brand with cutting edge interior design. Our knowledgeable team offer a turnkey service from consultation through to design and implementation. By the end of our process, you’ll have an office space to be proud of and one that will have clients coming back for more. Contact our team and we’ll be happy to begin transforming your space today.